I was part of the Indian team that beat the West Indies and England on their own soil in 1971. Those were memorable series, but on a personal note, the contest against Bill Lawry's Australians in 1969-70 was the highlight of my career. I had played two Tests against the visiting Kiwis prior to the series against Australia, and had batted at no. 7 in both games. Hence, it came as a surprise when Tiger Pataudi, our captain, informed me that I was to bat at no. 3 in the first Test, to be played at the CCI, Mumbai. Although I was a middle-order batsman, I had not batted at that number at any level before in first-class cricket. I spoke to my father about it, and he advised me to just forget my worries and go out and play. I went out and scored 74 against an attack comprising Alan Connolly, John Gleeson and the great Graham McKenzie, who was undoubtedly the best fast bowler I have faced. He was quick, deceptive, and could swing the ball both ways. He hardly gave the batsmen any respite, even when he operated with an old ball. He had a lethal off-cutter that I remember rather well, for he bowled me with this delivery twice in the series when I had crossed fifty and was well-set! In addition to his bowling capabilities, he was also an excellent fielder in the deep, competent catcher with bucket-like hands, and an effective lower-order bat. Alan Connolly, his ally, was a prodigious mover of the ball, who could swing it either way like a banana. After losing the first Test at Bombay, we drew the second at Kanpur, the highlight of which was a magnificent hundred on debut by the little G.R. Vishwanath. I happened to be the non-striker when Vishy walked out to bat in his first Test innings, and was dismissed by Connolly for no score. In the second innings, I was again at the other end when Vishy came in, his career on the line. He survived a confident appeal for caught-behind, but got into a groove thereafter, and what an innings he played! We bounced back to win the third Test at Delhi by seven wickets. Our spinners bowled beautifully and to help us batsmen achieve the target on the fourth day itself. Lawry had earlier announced his intent to fish in the Yamuna on the fifth day after 'finishing off' the game in four. Well, he did fish, but as the losing captain! It was in the first innings of this Test that I came precariously close to a maiden Test hundred, falling short of the markby only three runs. It was my fourth fifty in five innings. The Australians beat us in the fourth Test at Calcutta to go 2-1 up, and the final game at Chennai was expected to be a heart-stopper. It turned out to be a heartbreaker, for us! Australia, leading by 95 in the first innings, had been reduced to a believe-it-or-not 24-6 in the second innings. Prasanna had the batsmen in a tangle, and the debutant Mohinder Amarnath had bagged the key wickets of Stackpole and Chappell. 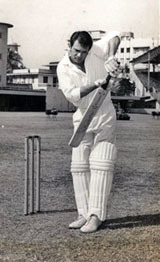 Ian Redpath, the only survivor amongst the specialist batsmen, then got a reprieve when he came down the wicket to Prasanna, missed and was stranded yards down the wicket. But Farokh Engineer, our keeper, muffed the chance. A grateful Redpath went on to score 63. His knock, as well as a fighting 24 by McKenzie, took the Aussies to a position of strength and we lost by 77 runs. The spin trio of Prasanna, Bedi and Venkataraghvan were in prime form, but they had to contend with some aggressive batsmanship by the Australians, who exhibited deft and delightful footwork. Ian Chappell and Doug Walters stood out. I remember spending many enjoyable evenings with these two, along with Brian Taber, the Australian wicketkeeper, and my teammates Vishwanath and Eknath Solkar. There was more than a touch of irony to these 'evening sessions', for in the field, Chappell would be at his verbal best, doing, or rather, saying everything he could to unsettle the opposition, along with Lawry himself. It was my first experience of 'sledging', for I represented Mumbai, then the strongest domestic side in India, in the Ranji Trophy, and there was no question of any opponent trying to upset us! Another abiding memory of that series is the 'farewell' that I paid to my 'lucky' pair of trousers, courtesy Tiger Pataudi! I batted in the first innings at Mumbai in my lucky pair, which did not exactly resemble the cream flannels in which the game ought to be played. I was pleased as punch with my 74, and was taking off my pads in the dressing-room when Tiger sat down next to me and mumbled; "It's the last time you are wearing these trousers!" To his great credit, he did not say anything when we batted together and added 146 for the third wicket, obviously realizing that I had worn the trousers for a specific reason. It was only after I returned to the pavilion that he expressed his displeasure, albeit in a restrained manner! Hats off to him!